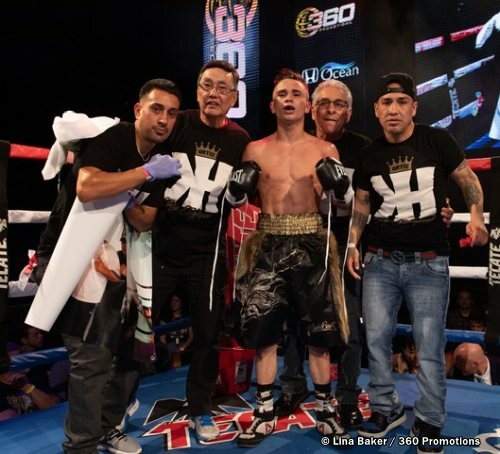 Fans in Southern California witnessed Saturday night the fourth generation from the Ortiz Family of Simi Valley, California, continue the family tradition in combat sports. Twenty-year old Timothy Ortiz made his successful debut last night on the undercard of the Serhil “El Flaco” Bohachuk vs. Cleotis “Mookie” Pendarvis at the Hollywood Fight Nights at the famed Avalon Theater on Vine Street in Hollywood. Ortiz stopped Anthony Torres in the third round of their scheduled four-rounder with a tremendous body shot that culminated in Torres dropping to the canvas after a series of punches following the hard body shot and was counted out by the referee. Timothy Ortiz is the son of Scrappy Ortiz who made his debut in 2001. Scarppy is the son of Robert Ortiz, a former body builder. Robert’s Dad is Mike Ortiz who was once a fighter himself. The Ortiz Family runs the Kid Gloves Boxing Gym of Simi Valley, California. The Hollywood Fight Night was promoted by Tom Loeffler’s 360 Promotions in cooperation with Tecate Beer. 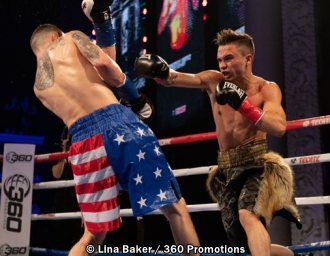 In the main event, Serhill Bohachuk (13-0-0, 13 KO) of Ukraine with a stoppage win over Cleotis Perdavis (21-5-2,9KO) . Perdavis was dropped in the first and third round and he did not answer the bell to start round 4. The real barnburner of a fight was between Mario Ramos (8-0-0,7KO) vs. Arnulfo Becerra (7-2-0,5KO). The fight was a thorough phone booth type of a fight that kept the fans on their feet throughout the six round fight. When the smoke cleared, Ramos came up the winner 59-55,59-55, and 58-56. Adrian Corona (4-0-0) son of a California referee, Ray Corona won by decision over Guadalupe Arroyo (3-16-0). Scores were all 40-36. Devon Lee (7-0-0,6KO) defeated Daniel Perales (10-16-2,5KO) by scores of 50-45 three times. George Navarro (5-0-1,2KO) beat Joseph Cuellar who is fighting on his debut fight. The split decision for Navarro was scored as follows: 39-37, 39-37 and 38-38. The Rodel Mayol assisted Cuellar lost his mouthguard in the last two minutes of the highly spirited fight. Christian Robles (3-0-0-, 1 KO) was dropped in the opening round but recovered well to defeat Jesus Godinez (2-3.0-1KO). Robles was trained by former world champion, Brian Viloria. In the curtain raiser, Meiirim Nursultanov (11-0-0, 8KO) beat Luis Hernandez (16-8-0,9KO) by unanimous decision. Scores were all 79-72.